← I had a traditional education in a convent and I loved it! Monday 16th Dec 2014 started like any other day. Students woke up and got ready to go to school but 132 children would not come back home alive. Many, many more will be spending days, weeks, months in hospitals. By the time the day ended Pakistan in particular, and the world in general, would be a different, darker, sadder place. Monday 16th Dec 2014 started like any other day. Students woke up and got ready to go to school. Today was the day of their Chemistry exam. They got ready, were wished good luck and kissed goodbye by their parents. They went to school and entered the room where they were going to sit the exam. Many would not leave the room alive. Those who did would be physically injured and mentally scarred. By the time the day ended Pakistan in particular, and the world in general, was a different, darker, sadder place. Monday 16th Dec 2014 started like any other day. Students woke up and got ready to go to school. They were excited. Today they were going to attend a First Aid course. They got ready, were kissed good bye by their parents and went to school. They had gone to school to learn First Aid but they ended up in hospitals, on operating tables with surgeons battling to save them or on trolleys in mortuaries. By the time the day ended Pakistan in particular, and the world in general, was a different, darker, sadder place. Monday 16th Dec 2014 started like any other day. Students woke up and got ready to go to school. They were excited. Today was the day some of them were going to have their farewell party. They got ready, were kissed good bye by their parents and went to school. They had gone to school ready to enjoy the festivities but instead of party poppers they heard gunshots. Again and again. For hours on end. And screams. Screams of friends, of classmates, of staff. By the time the day ended Pakistan in particular, and the world in general, was a different, darker, sadder place. Monday 16th Dec 2014 started like any other day. Men and women across the city woke up and got ready to go to work. Some were going to spend part of their day invigilating a Chemistry exam. Some were going to help organise a party for their students. Some were going to help organise a First Aid Course. It was not to be. Instead of the pin drop silence in the exam hall there were gun shots and screams. Instead of the laughter in the room where the party was to be held there were gun shots and screams. Instead of the eager questions in the room where the First Aid Course was being held there were gun shots and screams. By the time the day ended Pakistan in particular, and the world in general, was a different, darker, sadder place. Monday 16th Dec 2014 started like any other day. I dropped my daughters to school and came back home. I made a cup of tea and checked my Facebook and suddenly the world became a dark, desolate place. Evil (I refuse to call them men or even animals) had visited a school in Peshawar. I could not stop crying. I didn’t cry just because evil visited a country I have links with. I didn’t cry just because the jumpers those kids had on resemble very closely the school uniform jumpers my daughters wear. I didn’t cry just because I’m a mother. I cried because I am human and the evil that visited that school was anything but. I cried when I read about the boy who was shot in both legs. He folded his tie and stuffed it into his mouth so he wouldn’t scream and played dead while bullets were being “pumped” into bodies of his fellow students. I cried when I read that possibly only one Year 9 student survived. I cried when I read about the teacher Afsha Ahmed, who bravely faced evil and said that they would have to go over her dead body to get to her students. They doused her in petrol and set her alight. I cried when I read that the Headteacher, Tahira Qazi, was rescued but refused to leave her students behind and was killed protecting them. I cried when I read about another teacher, Sir Fazil-e-Karim who was injured but refused to go to the hospital. He insisted he was ok and went back in to help his students. I cried when I read about the mother who lost both her sons but went to the hospital to donate blood so others could be saved. I cried when I read about the boy who before he was rescued used his mobile to ring his mother and told her not to worry as he was fine. He had lied. He had been shot in the chest. I cried when I read that evil entered a room and asked students if they were related to anyone in the Army. Those who put up their hands were shot in front of their classmates who were then shot too. I cried when I read about seven and eight year olds with gunshot wounds to the chest, face and head. I cried when I read how a boy stayed motionless on the floor with the dead bodies of his friends on top of him before being rescued. I cried when I saw pictures of walls riddled with bullet holes, of blood splattered on walls and floors, of upturned desks and chairs, of blood stained papers, books and shoes and of coffins, those rows and rows of coffins, each holding not only precious bodies of precious children but hopes and dreams of parents, families and the nation. I cried when I read about the father telling a reporter that his son had gone to school in his uniform and now he was bringing him home in a burial shroud. I cried when I read about the father who wondered how he was going to tell his wife their son had died and what he would say when she asked him why had their son died. And I cried when I heard about the boy, Aakif Nadeem, who turned up at the school the next day proudly wearing his blood stained blazer. He says he wants to go back to his school, to his classrooms, to the auditorium because “they cannot defeat us. We are still up”. Monday 16th Dec 2014 started like any other day. By the time the day ended Pakistan in particular and the world in general was a different, darker, sadder place. 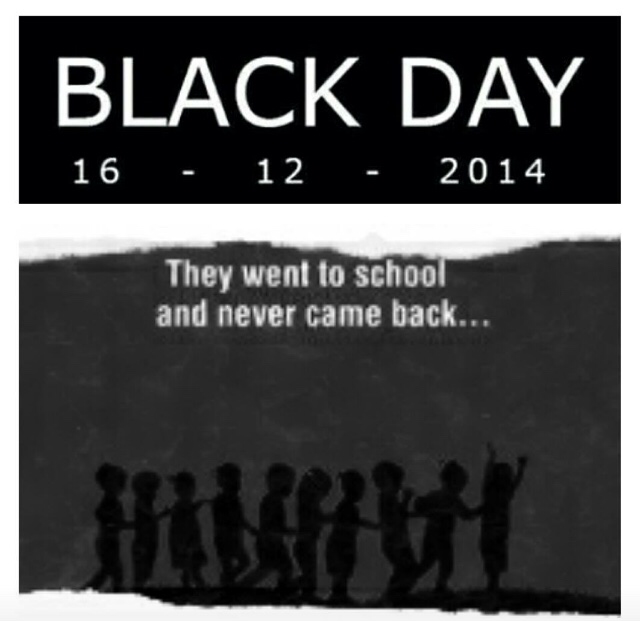 16th Dec became Pakistan’s 9/11 but Aakif, Afsha Ahmed, Tahira Kazi, Fazil-e-Karim and the others belonging to that school, living in Peshawar and elsewhere in Pakistan have proved that evil will not, cannot triumph. These deaths were not a punishment for attending a school but punishment for their connections with the Army which is waging a war against terrorism. The atrocities committed in the name of Islam have nothing to do with Islam. It is time to reclaim Islam from evil. If we can do that, then these deaths will not have been in vain. And we must do that. We owe it to them.